FastStone Image Viewer is a free (for personal and educational use) image browser, converter and editor for Windows. FastStone Image Viewer can be downloaded and installed as a single executable file (.exe) or as a zip file from the developers website . There is also a portable version that you can carry on a removable storage device (USB stick for example) and which requires no installation. 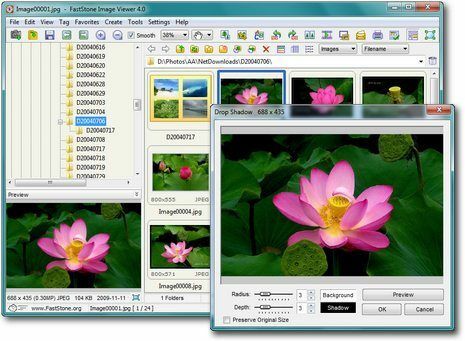 FastStone Image Viewer supports all major graphic formats (BMP, JPEG, JPEG 2000, animated GIF, PNG, PCX, PSD, EPS, TIFF, WMF, ICO and TGA) and popular digital camera RAW formats (CRW, CR2, NEF, PEF, RAF, MRW, ORF, SRF, ARW, SR2, RW2 and DNG) and displays all EXIF information. When you start the application for the first time, you are presented with three panels: In the left window, you can browse through your photos folders in a window tree in a Windows Explorer-like way; In the right panel, you can view thumbnails of the pictures present inside the selected folder; Lastly, a resizable preview panel is available in the bottom left corner: using the magnifier in the preview panel allows you to zoom on the selected image, while double-clicking on the preview window will launch the corresponding picture in full-screen mode. Panels are resizable: hover over the double vertical line or the double horizontal line that separates two of the windows to turn the mouse pointer into a two headed arrow, and click and drag the line to resize the applicable windows. In browser view, editing tools are logically accessed from the top menu: the most commonly used tools are available through a set of small icons (download photos, zoom in/out, crop tool, rotate tools, slideshow, screen capture, etc) while many other editing tools (more about this later) can be accessed by using the edit drop down menu. When selecting a tool in the edit menu, the image will open in a pop-up window mode with different options and settings available for each tool. The second view mode is called windowed view: it basically gets rid of window tree and thumbnails, whilst the top menu bar (where all editing tools can be selected for example) remains. From browser view, it is possible to switch at anytime into windowed view by clicking on the corresponding button in the upper right hand corner (screenshot below). Once in windowed view, to go back to browser view, click on the button again. Windowed view maximizes the screen so more space is available to work on a specific image, whilst retaining the familiar top menu bar with direct access to all editing tools and settings. This third mode, which displays an image as large as possible, can be accessed in different ways: from thumbnails view, you can, for example, click on the ‘switch to full screen button‘ in the upper right hand corner (screenshot below). You can achieve the same thing by double-clicking on any thumbnail or by double-clicking on the preview image as well. Full screen view expands the image so it now occupies the whole screen space. Not only the thumbnails and window tree are gone, but the top menu bar is also hidden from view. For this reason, this mode is probably the best when working on large image(s) for maximum precision and comfort. As the top menu bar is not present in full screen view, accessing the various editing tools is now done by right-clicking on the image, which opens a contextual menu with most of the tools already available in browser mode. In full-screen view, selecting a different picture within your selected folder or browsing to a different folder remains simple: just move your mouse pointer to the top of the screen. This will reveal a horizontal thumbnail browser where you can view thumbnails of all the pictures available inside your folder: from there, you can click on any of the thumbnails to view and edit the picture in full-screen; you can also navigate to other folders on your disk using the left and right arrows. A small set of icons is available below the thumbnails to launch basic tasks (for example, to rotate your image left or right, compare 2 images, print or email them or launch a slideshow) but these tools can of course also be accessed through the contextual menu (right-click). Interestingly, if you were not comfortable with the horizontal browser available in full-screen mode or if you needed to browse through lots of different folders, the traditional Windows-Explorer like folder tree used in browser mode is still available in full-screen mode by clicking on the ‘folder tree’ button on the left, which will expand it. In full screen mode, all information (EXIF metadata, histogram) can be accessed by clicking on the ‘Image Property‘ expandable window in the right side of the screen. The full-screen mode background (if the picture doesn’t cover the whole screen) can be adjusted in the settings menu to any colour you like and the image file text colour accordingly. A very useful ‘compare images view’ is available (normal view or full screen view) where 2 to 4 images can be viewed side-to-side. As well as the edit drop-down menus and icons, all major functions can be performed through the use of keyboard shortcuts, which can save you lots of time and potentially reduce mouse strain injury – for example, you can use L to rotate an image to the left, R to rotate an image to the right, + to zoom in, – to zoom out, Ctrl + R to resize an image, etc. All shortcuts are given next to each tool in the various menus to make them easier to memorise. The settings window contains eleven tabs with numerous settings in each: this is a bit overwhelming at first but it allows the user to finely tune the application to their needs; however, for the majority of users, most default settings should be fine. The viewer tab should be your starting point because you can change the start up folder from there. If you want to launch your images in a different view mode (image can be directly opened in browser view, windowed view or full screen when double-clicking on them in Windows explorer), or change the default browser style or mouse wheel behaviour, this is also the right place. Other tabs are thumbnails (where you can adjust their size, border or background colours etc), magnifier (to adjust zoom ratio, magnifier size and shape), the default jpeg quality (you can override this when saving each individual picture, otherwise this default value will be used), the RAW files settings (for pro or semi-pro photographers), the dual monitor settings (you can preview your image on your second monitor for example), the colour management system setting, file associations (so you an open certain files in FastStone Image viewer and others in a different editor for example), favourite folders, external programs and slideshow music background. Organising and managing your images in FastStone Image viewer is simple and intuitive, thanks to the drag and drop sorting and tag functions. Though the editing tools don’t match what’s available in full-featured commercial suites such as Paint Shop Pro or Adobe Photoshop Elements, FastStone Image viewer still offers plenty of tools to enhance, tweak your shots or optimise your pictures for the web. For example. you can flip, rotate (lossless, apparently, for JPEG files), resize, crop, sharpen or blur pictures. You can also turn an image to greyscale, sepia or negative and adjust lighting, colours, curves and levels. There are several border effects, shadows or frame masks available – the latter are not all tasteful though !– and some additional effects such as lens, morph or bump map can be added to your creation. Basic drawing tools are available such as texts, lines, shapes or callout objects on images. A clone stamp and healing brush are provided if you need to heal old photos for example, as well as the usual red eye removal tool: although semi-manual (you need to draw an ellipse on the area first), this simple tool works really well. As well as downloading pictures directly from your memory stick, you can acquire them with your scanner using the scan board. When your pictures are ready, you can print them (FastStone Image viewer still offers good control on the page layout), email them as an attachment or create a slideshow (with other 150 transition effects and then there’s the possibility to add your own MP3 as a soundtrack). If you have a large quantity of images, batch processing and renaming and easy to use contact sheet builders are available. Screen captures can be performed with several options: full screen, window, foreground, rectangle and freehand. FastStone Image Viewer is a fast, stable and versatile editor. The interface is quite intuitive given the variety of screen modes and options. While it may not win a prize for the most beautiful interface (it provides a collection of different skins if you don’t like the default one though), it is very fast and highly configurable. The full screen mode may take a bit of time to get used to but one can gradually get familiarised with the other view modes available at first. FastStone Image Viewer is a really clever tool and a real time-saver. It’s not really a criticism but some users might enjoy some sort of integration with photo sharing services like Flickr (maybe as an add-on?). FastStone Image Viewer is free of charge for personal and educational use. For commercial use, purchasing a license though the developer’s site is required. Alternative Program: Ashampoo Photo Commander.